The Penny Passport book is made of black vinyl with embossed text and seal in gold. The Penny Passport book, opens up with three flaps. The book holds 36 pressed pennies, as well as space for 8 pressed quarters or nickels. This souvenir book is a great way to store and display your smashed pennies! 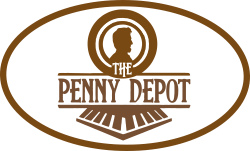 The Penny Passports are a favorite among Elongated Coin Collectors. Need somewhere to keep all those shiny pennies you have acquired through your travels? The Blank Pressed Penny Souvenir Book will provide a sturdy home for 44 elongated coins. Why collect souvenir pressed pennies from your travels? They are an inexpensive souvenir. They are small so they don’t weigh you down during your outing or once you get it home. You don’t feel like you have wasted money on infinite other options for souvenirs that will ultimately lose their appeal. Retailer? Contact us now to have Souvenir Books in your store. My little one LOVES to make pennies every time we see a machine while on vacation. We have had a collection of them just sitting in a baggie. When I saw this product I knew I had to get it! She helped me put them all in and loves to carry it around and look at them! And then we can sit and talk about all the fun places we went and all the fun things we did! Can't wait to fill the entire booklet up! Product is as advertised. It arrived on time and the kids loved it. Fast ship & great prices from this fine eVendor !! Bought 2 as Christmas present for someone who collects penny souvenirs everywhere she travels. The Christmas smashed pennies that were included were an unexpected bonus! A neat and cool book to collect souvenir pennies, I am happy I bought this.